Considering the amount of time that I’ve spent sailing, you would think that I might have developed a better grasp of the subject of sail twist before now. But that’s the fun of sailing – there’s enough to it that there is always more to learn and understand. The new junk rig, with its abundance of sail control lines, makes for a great opportunity to go more deeply into the details of sail shape and orientation to the wind. As a result of this new opportunity, I’ve been studying more on the subject of sail twist. This refers to when the angle of the boom relative to the centerline of the boat, and the angles of each batten and of the yard relative to the centerline of the boat, are all different, making the sail into a complex curve. It’s quite pretty when it does this, and in some situations it’s ideal for driving the boat. In other situations – especially sailing upwind – it could be preferable to have less twist. Controlling this aboard AUKLET involves that long zigzag line that goes between the sheetlets (the thin lines tied to the battens) and the wooden friction block called a euphroe. That long zigzag line is called a “sheet span,” and it eventually comes back to the cockpit where it can be pulled in tighter or let out, separately from the sheet itself. During the recent sea trials, there was a lot to learn about fastening points for all those many control lines, including for the sheet spans, of which there are two for each sail. Hardly anybody with a Western junk rig uses this traditional Chinese arrangement, of euphroes and sheet spans, and in addition to that, double sheets; it’s too early to tell whether I’m going to think it was a good idea to set things up this way. It could of course always be changed, but I’m having a good time working with it for the moment. So far, it’s clear that for this arrangement you need a lot of cleats! Or belaying pins, or something. The mizzen sail, with the belaying pin collar around the mast and existing cleats on the partners, had almost everything it needed in the fastening-points department – except for a proper place for the sheet spans. Controlling the mainsail during the recent sea trials, on the other hand, involved a jumble of stacking as many as four lines on existing cleats that were too small for so much traffic, while I was in the process of working out where to put new bits of hardware. As a result, for most of the time on this fall trip, carefully defined sail shape was mainly a distant goal. 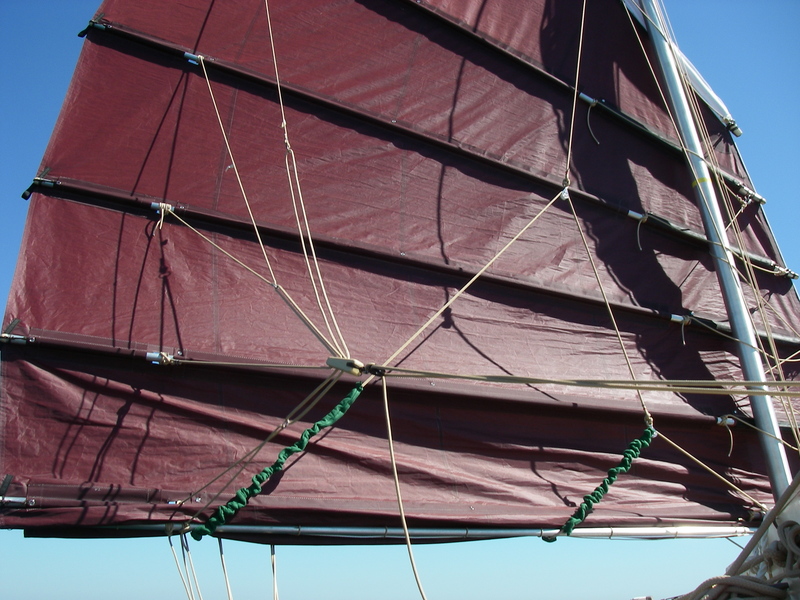 Before that second phase of adjusting the sheet span lengths in and out of the euphroe, what you get when you haul in on the end of the sheet span is the top of the sail pulled close, the middle of the sail farther out, and the boom close. This is not a recommended sail shape in anybody’s book. The way the line runs through the euphroe is a little complicated – it makes sense, and creates an orderly arrangement for avoiding crisscrossing among all the zigzags, but it’s not the least bit intuitive when it comes to achieving tension where you want it. I’m assuming that I’ll get better at this, with practice – in the meantime, during the learning process I decided that significant sail twist was the order of the day. It did, however, give me lots to ponder. As I now understand it (any and all errors are mine alone), when a sail is twisted, the angle of the sail to the wind is different along each horizontal line of the twisted sail. Sailing upwind, it’s quite important to have the sail at just the correct angle to the wind – too broad, and you’re not going upwind as much as you could, too close to the angle of the wind, and the boat barely moves. There’s a sweet spot in this, that new sailors learn to gauge by looking at the sail, and feeling the movement of the boat and pressure on the steering. When it’s working well, the boat moves at a good clip, making steady progress at a relatively close angle to the direction that the wind is coming from. Complicating things further, in a junk rig there is the question of camber, or the bit of belly that can be built into the fabric of the sail. Most typical Western sails, Bermudian, gaff, and others, have this, while Western junk rigs used to be almost universally flat. This is presently a big topic of debate in the junk rig community, with camber having become quite a bit more prevalent among Western junk rig sails. On the other hand, there is an argument that a fanned shape of junk rig – such as the Reddish rig now on AUKLET – can work well with panels that are flat, because the twist of the fanned panels creates camber in the overall sail. The big deal about camber is that it helps with sailing upwind. So now how about this? You want camber for upwind progress, but you want a sail with minimal twist for upwind progress. Now what?? Of course the beautiful thing about all of this is that you can go sailing regardless, and have a perfectly lovely time, and travel great distances – the only difference is that you might be more, or less, efficient along the way. Now and then this can really change your day. As discussed in the post titled “Motorless,” on this recent trip I tried for a northbound run through Plum Gut on two different days, the second day finally getting around the end of Orient Point and through, to go back across Long Island sound to Connecticut. The first attempt was abandoned when I was not able to get around a particular tiny point at a bend in the shore, along the way toward the end of Orient Point itself. 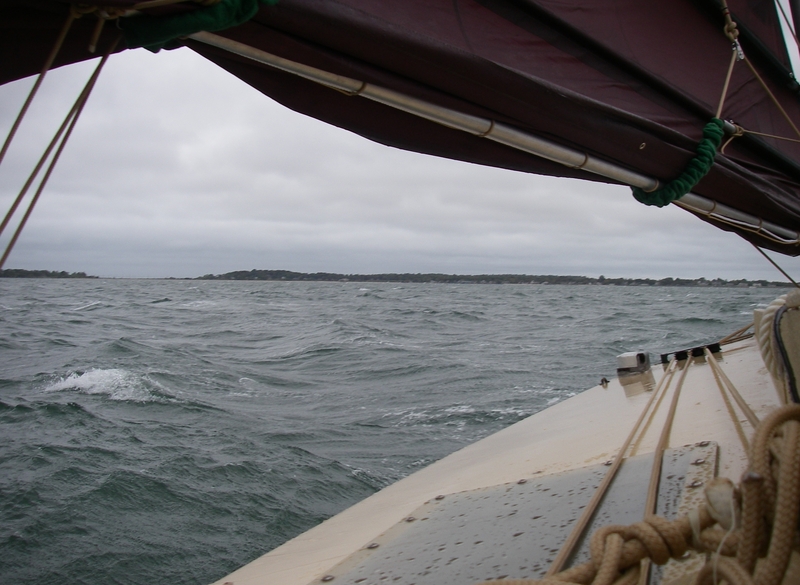 It was an upwind process, and the current had turned the wrong way, and tack and tack as I might, there was going to be no getting around that corner. With just a hair more progress on each tack, it might have worked. That’s when I started really thinking about sail twist, and realizing there was something truly significant there, that I really might want to understand. During the afternoon of that first attempt there was quite a bit of wind, and waves to go with it. It was hard to tell for sure what sail arrangement was working better, or not so much. Along the way I tried pulling in the sheet span, with the idea that perhaps less twist would be good. This pulled in the top third of the sail or so (it was reefed to three panels), but as described earlier, it would have involved adjusting the line through the euphroe to make for a decent sail shape. In the waves (and rain!) I wasn’t so inspired to manage that more difficult project, especially since it was all experimental with my understanding at the time. In the end, I let the sheet span back out, to create a sail shape that looked better, being more evenly distributed from top to bottom, and back to pretty much its original twist. 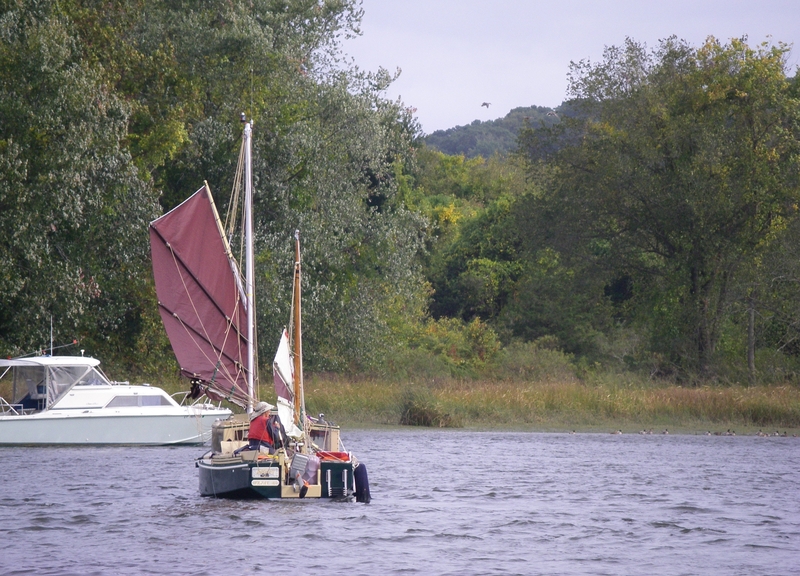 The funny thing was, that when that sheet span was pulled in tight I had the odd feeling that the boat was moving better – uneven sail shape and all. But I convinced myself that I must have imagined that, because how could it be possible, with the sail looking so crazy. Knowing (after some effort) that it was beyond sensible in the bouncing waves to get the sail both untwisted and even, with my baby level of euphroe-adjusting skills, that was the end of that. But now I wonder if that poor middle shape didn’t matter that much. Perhaps what happened was that with the upper panel pulled in almost even with the boom, at the best angle to the wind for progress, there was indeed more drive in the sail, and it didn’t really matter so much about the middle section that was all crazy. 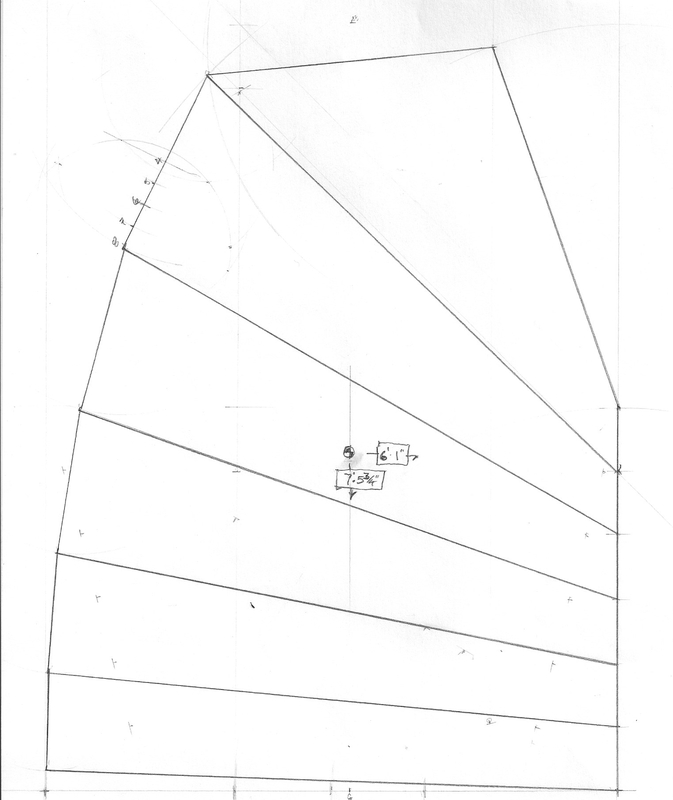 Interestingly, if that was true that the irregular shape was less important than having another panel at the correct angle to the wind, it would seem to say that the consideration about the fanned flat sail creating camber by twisting was not the primary issue either, at least in that particular set of conditions. It would appear that the aspect of the situation that was making the most difference was having the most sail area possible at the correct angle to the wind, and if that was the lower panel and the upper panel, with a chaotic middle, so be it. (Of course, just think, if they were all at the correct angle!) Now I wonder if I would have made it around that point, if I had left the sheet span pulled in tight like that, even with its uneven distribution and funny-looking sail. As it was, with the afternoon advancing, I turned around and had a nice, zippy ride back downwind to Shelter Island, and everything worked out just fine. But I’m really looking forward to going further with this subject of sail twist and upwind efficiency. It’s a treat, to see this long-term puzzle finally becoming clearer.